At TABtouch, we're not like every other betting provider. We are WA owned and when you bet with us, a portion of every bet helps fund a better racing industry. In fact, over the last 5 years, TABtouch has given back over $500 million to WA racing; enhancing venues including Perth Racing and Cannington Greyhounds, the Gloucester Park Bridge Bar, Ascot Grandstand and other race track facilities across WA. But it doesn't end there, we've also awarded grants to local sporting clubs and contributed to various community programs and charities. So remember when you bet with TABtouch, a portion of your bet helps better WA. So better your bet with TABtouch. 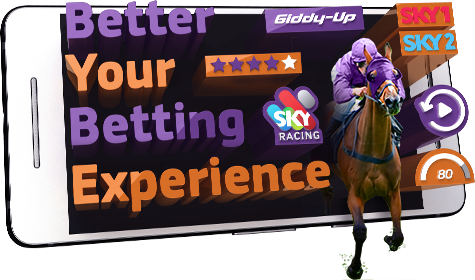 At TABtouch we know that you love a better betting experience that’s why were focused on providing better features such as Giddy Up, Sky Racing and Race Replays. Learn more about bettering your betting experience here. Expert ratings, speed maps and more. On all the best sports and racing*. Stream Australia's best racing for free. From Australia's best racing tipsters. Sky Racing vision applies to all Aus. & NZ races ex. NSW thoroughbreds. Race Replays applies to all Aus. races ex. NSW & VIC thoroughbreds. Premium content (Giddy-Up, Live Streaming and Race Replays) are available to active TABtouch account customers (who have placed at least one (1) account bet in the last 30 days). Due to broadcasting rights with our vision partners Sky Racing Live Streaming video is not available to international viewers based outside of Australia and does not include NSW thoroughbred racing. RWWA's gambling operations are governed by its Responsible Gambling Code of Practice and for South Australian residents by the South Australian Responsible Gambling Code of Practice. Don't gamble more than you can afford to lose. Call Gambling Help WA (08) 9325 5133 enquiries@centrecare.com.au or Gambling Help on 1800 858 858 or www.gambleaware.com.au. Stay in control. Leave before you lose it. Gamble responsibly.